We want the best for our kiddos, so we teach them right from wrong, we teach them to respect and love each other, we teach them to compete against only their personal best, we teach them the ins and outs of life and friendships. But are we teaching them about God? My affiliate link is in this post. Family devotional time is a must. We can’t leave it up to the Sunday school teacher. Most of these teachers don’t really teach the WORD in all its depth to our kids. No offense to anyone, but it is mostly silly songs, coloring pages and bible stories. While this stuff is important, the meat of the Word is vital for our kids too. Just because they are children doesn’t mean they can’t learn the things of the Spirit. They have the same Holy Spirit living within them that we do. I used to be a kid church teacher and we talked about real scripture, healing, true praise and worship, giftings, callings and all other things of the Spirit. Teaching them the Word of God is the most important of all the lessons they will learn. Because out of the Word flows all the things of life. Learning to love the Word, study the Word, respect the Word, have a relationship with God through the Word. This is the life lesson I want my girls to take from me. If they only learn one thing from me this is the one thing I hope they will learn. The Bible is a life-changing, life-giving, life-empowering, living book that will always guide them through this life. It is so very important that they have created a habit within themselves, that when they have a problem they run to God through the scriptures to find an answer. This should just be natural to them. Oh, you have a problem, well let’s pray about and go to the Word for the answer. This is what I want my girls to do in every situation, trial or problem they run into in their lives. If I only accomplish this, then I have succeeded as a homeschool mom. 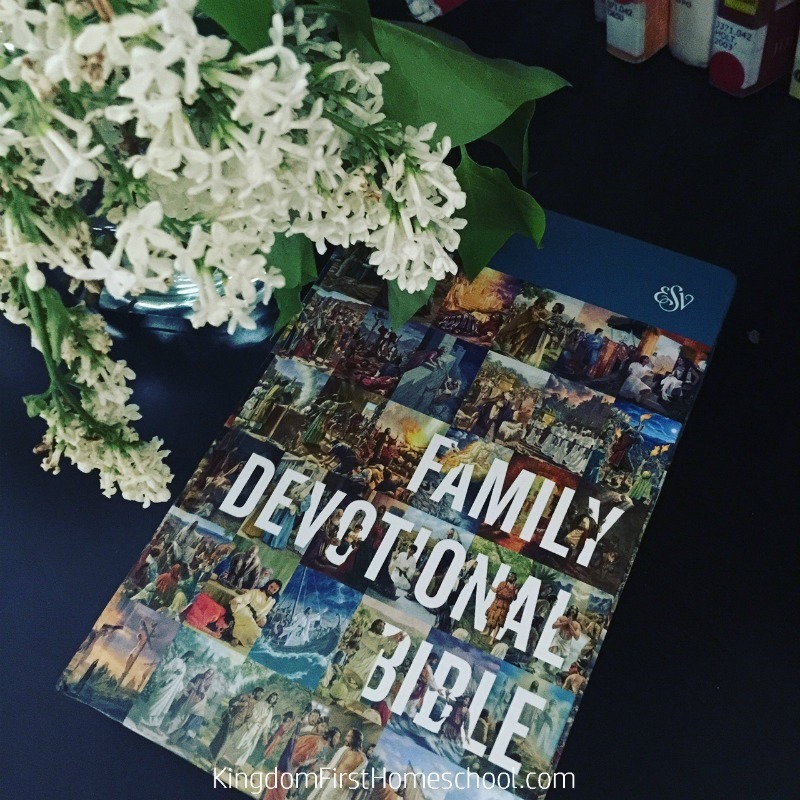 It’s so vital that our kids see family devotional time as a normal and expected part of everyday life. So when they are grown they will already have good habits in place and they will carry it through to the next generation. 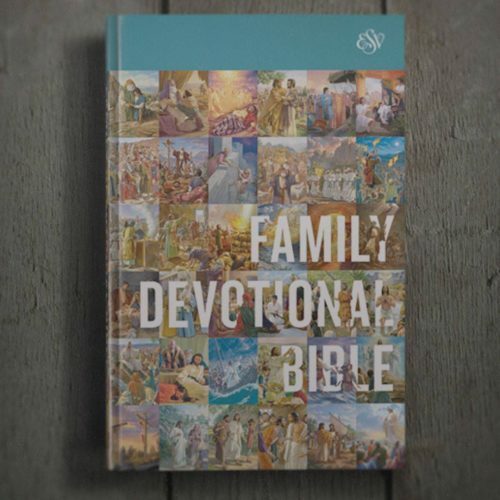 We recently had a chance to check out the ESV Family Devotional Bible from Crossway. When I received it I was a bit disappointed at first glance, because the lettering seemed so small. I love the larger print, but this seemed super small for me. But after checking it out it wasn’t too bad, about the same as any bible would be I guess. What I loved about it was that it has illustrations throughout, while this isn’t a need when reading the bible with my kids, it’s a bonus. It brought back fond memories of my first bible, which was misplaced sometime over the years. This is in ESV version, so it’s easy to understand and flows quite nicely. It’s the complete bible, Old and New Testament. But it adds a bit of a twist that I totally love. Along with the scriptures, it has a devotional story bible within. It has all the rich truth of the scripture while adding in a devotional story about the text you just read. Love this for my kids. And it doesn’t stop there, it also has engaging questions for us to get some good spirit-filled conversations going between the girls and I. We have had some great times going through this so far. It really pulls the story and lessons we want our kiddos to learn right out of the scripture for us. Before we would read the main stories and the scripture separate, but now with this devotional we have it all in one. Genius. If this sounds like it would be a perfect fit for you and your family you can order yours now. Just head on over and grab your copy. And guess what! We are giving away one of these beautiful devotionals to one of you, my sweet friends! So enter below! I hope you win! I am always on the hunt for a good family devotional. Something that helps make time this together worthwhile. Awesome giveaway, Forest! And I agree! Family devotional time IS really important!! I like the idea of having questions to discuss together as a family. We’ve finished with the other books that we were using for family devotions! I agree that getting them to diverify deep in the bible is SO important!